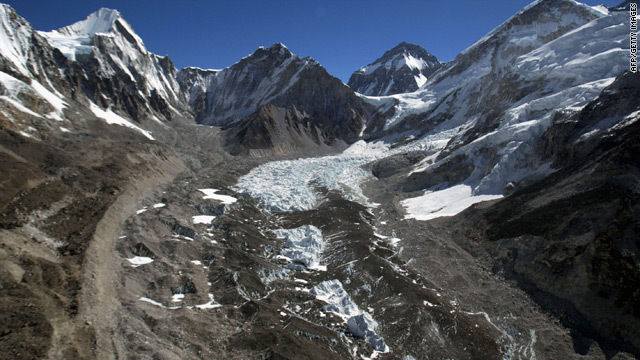 The IPCC report stated that Himalayan glaciers, like the Khumbu Glacier along Everest's Himalayan range, would vanish by 2035. The review called for the IPCC to "fundamentally reform its management structure"
(CNN) -- The United Nations' climate body needs to "fundamentally reform" if it is to prevent a repeat of the error that led to the publishing of a report warning that Himalayan glaciers could melt by 2035, an international committee reported Monday. The five-month review called for the Intergovernmental Panel on Climate Change (IPCC) to "fundamentally reform its management structure" and strengthen its procedures to handle "increasingly complex climate assessments." The InterAcademy Council, a scientific umbrella organization, also called for the setting up of an executive committee to replace the IPCC's largely part-time structure. It also asked for checks on conflicts of interest by board members and stricter limits on the terms of the chairman, a position now held by Rajendra Pachauri. The report says said the post of IPCC chair and that of the executive director should be limited to the term of one climate science assessment. "Operating under the public microscope the way IPCC does requires strong leadership... an ability to adapt, and a commitment to openness if the value of these assessments to society is to be maintained," said Harold T. Shapiro, president emeritus and professor of economics and public affairs at Princeton University in the U.S. and chair of the committee that wrote the report. On Monday Pachauri said that member nations of the IPCC will decide whether he should stand down in the wake of the report, Agence-France Presse reported. "This will be debated by all the governments of the world and they will decide what is to be implemented and when it is implemented," Pachauri told a news conference at the U.N. headquarters. The IPCC released a 938-page study in 2007 pointing to evidence that climate change was already hurting the planet, building momentum for global action to limit carbon emissions that mostly come from burning coal, gas and oil. The study, known formally as the Fourth Assessment Report, helped earn it a Nobel Peace Prize that it shared with former U.S. vice president Al Gore. In January this year the IPCC said estimates relating to the rate of recession of the Himalayan glaciers in its Fourth Assessment Report were "poorly substantiated" adding that "well-established standards of evidence were not applied properly."